The largest sector of the septic tank pumping industry is residential septic infrastructure and B&B Pumping has been serving the residential pumping needs of the area since 1958. In some cases a septic tank was the only alternative to the city sewer that may have not always reached the home. Due to growth, many septic systems have been abandoned or hooked up to the municipal sewer system. In many areas however, the use of a septic system is much more preferred than the city sewer system. 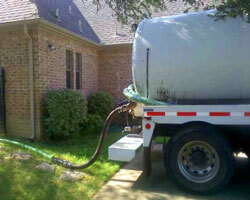 Covering Fort Worth and its suburbs, B&B Pumping is your local septic tank pumping service. We are experts in both aerobic and conventional pumping, we have the equipment to access pretty much any residential septic tank. That last thing you want to do is try and put off having your septic system pumped. No matter how good your septic system is, it needs periodic pumping services in order to keep it functioning at its peak. B&B Pumping generally recommends to our customers that 3 to 5 years is the general rule of thumb for having your tank cleaned and pumped. Fast Service – With No Hassle! 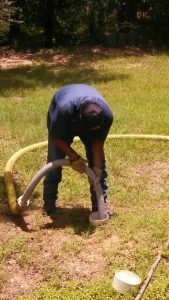 Our septic cleaning professionals will ensure that your septic service is not a hassle and in some cases we may even be able to schedule your service call for the same day. Our technicians will evaluate the health of your system and make recommendations based on what they have found. B&B Pumping takes great pride in doing the job right and keeping your septic system running as efficiently as possible. We serve Fort Worth and the surrounding communities of Haslet, Azle, and Decatur. Of course we are equipped to service our neighbors throughout the region. Simply give us a call for more information about residential septic tank pumping. As always, thank you for your business and we look forward to hearing from you!